February 2017 marked the sixth consecutive year that Missionary Air Group and its Rus Rus Hospital has partnered with International Health Service of Minnesota (IHS) to host a major medical outreach to the Miskito people group. 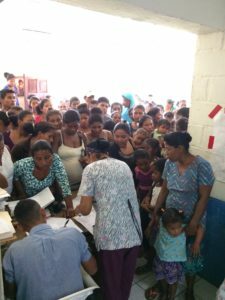 Rus Rus was one of five clinical sites in the Mosquitia region to receive IHS teams simultaneously over the two week period from February 10-23, 2017. Missionary Air Group not only hosted IHS in Rus Rus , but provided air support (supply line logistics, team insertion and extraction, and patient evacuation) for all the IHS sites in the region. A sea of people crowds the patient registration desk. This year was the biggest year to date for this event with the largest MAG staff participation, more total patient encounters, more critical patient evacuations, and greater regional impact than in any previous year! MAG had a combined missionary and national staff of 15 in addition to an IHS compliment of 10 – for a joint team of 25. The rest of the record breaking numbers looked like this: over the course of 14 days (8 clinic days), MAG pilot Sean Donnelly flew 71 total flights (nearly 40 hours of flight time operating from 6 different strips) conducting 12 medical flights transporting 30 emergency and surgical patients. The Rus Rus Hospital crew had 736 medical consults, 387 dental consults, 1253 pharmacy consults, and 144 vision consults, plus 2 minor surgeries (on-site) for a TOTAL of 2522 patient encounters in 8 days – nearly a thousand more than any previous year! Las Dentistas – three chairs at full speed, each dentist saw an average of twenty patients per day, for extractions and now, fillings and cleanings too! This year was special for other reasons too. There was unprecedented participation by MAG National (Honduran) team members, numbering 10 of the 15, with the remaining 5 being MAG missionary staff. Three Honduran dentists, Doctoras Gabriella Melendez, Maria Galo, and Sayda Napky, joined our team from San Pedro and Roatan. Everyone worked together tirelessly to provide patient care by day and spiritual care by night, with Bible studies and worship services almost every night for those who had traveled great distances in search of “help and hope”. Dr. Gerard Rudy and MAG head nurse, Geraldina Coleman, working in our small Rus Rus operating room. MAG Pastoral team members, Pastors Carlos Paz and Roman Chow conducted services, Bible studies, and prayed with patients. 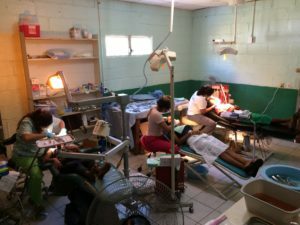 One evening, when Dr. Gerard Rudy finished a surgery at one end of the hospital, the patient, a Nicaraguan lady who had walked more than a day with an abscess on her achilles tendon, asked to be wheeled down to the worship service that was happening simultaneously at the other end of the hospital. She wanted to hear the preaching of God’s word and to worship Jesus. 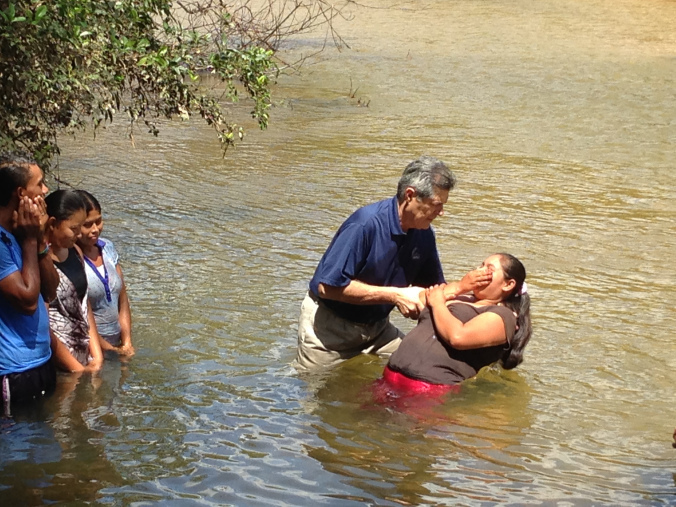 Several who were present at that service made decisions to receive Christ and asked to be baptized. So, a baptism was planned for Sunday afternoon in the Rus Rus River. What a joyous way to finish a week that had started so sadly. It was only the previous Sunday when a baby from Rus Rus was brought into the hospital in respiratory distress – the same hospital he had been born in just 18 months earlier. Unable to stabilize his breathing or vitals, the MAG aircraft, with pilot Sean Donnelly, was dispatched for an emergency evacuation. Sadly, baby Mark Anthony passed away during the flight. Upon returning to Rus Rus, Sean was then asked to preach at the family’s home during a prayer vigil that night – which he did – with the entire village gathered. It was a sad but precious time and, the start of a week that saw thousands helped, treated, encouraged, and saved – physically and spiritually – as they were ministered to by the people of a small, faithful, grieving village. That next Sunday, six were baptized! MAG president Sean Donnelly along with MAG missionary, Pastor Carlos Paz, preaching to a crowd at a spontaneous baptismal service. MAG missionary Pastor Carlos Paz baptizing in the Rus Rus River. Villagers, visitors, patients, and team members gathered together for an evening worship and preaching service, while surgery was going on at the other end of the hospital. All these children walked with their families from villages in Nicaragua to come receive medical care – and a little love – from the team in Rus Rus. Precious cargo – MAG pilot Sean Donnelly flies a 4-year-old surgical patient and her mother back to their village after the IHS surgical team successfully removed a tumor from the girl’s neck. The lollipop helped too! MAG’s Cessna 206 “One Nine Zulu” in the village of Ahuas just after landing. The mission was to pick up more dental anesthetic from the Moravian hospital there to keep the dental team going in Rus Rus. Thanks for the help guys!